Greetings from a wintery cold Harlow Carr! 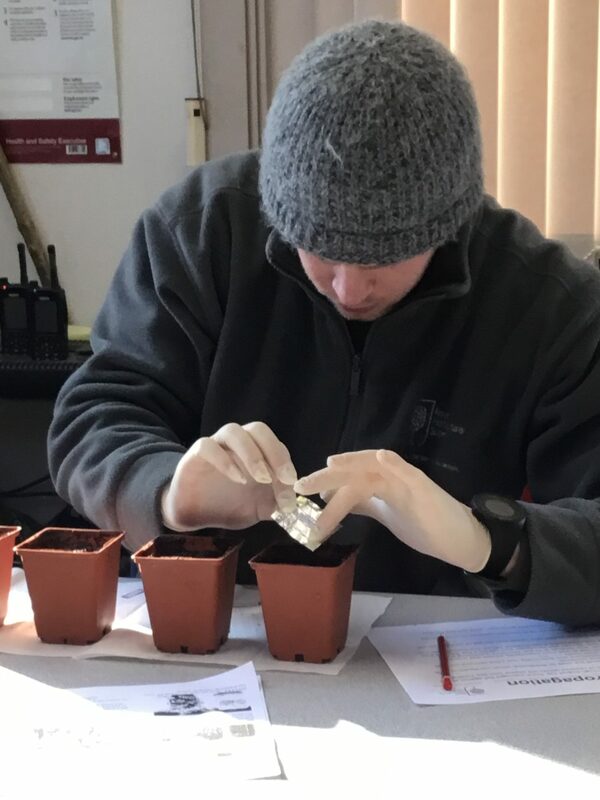 Thankfully we are holding our annual spore sowing classes at the moment, which allows us to stay in the warmth inside! It’s that time of the year when spores are available to BPS members and each year I do a short demo for students. I learned a method from other fern enthusiasts where I can sow the spores in a setting that is not a sterile laboratory and can be done almost anywhere. 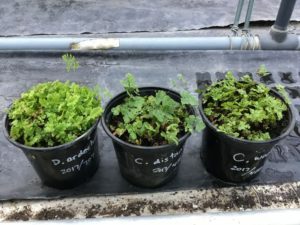 With help from literature from the BPS we have had a few good batches, using materials such as small pots, well drained soil, boiling water, microwave and cling film. 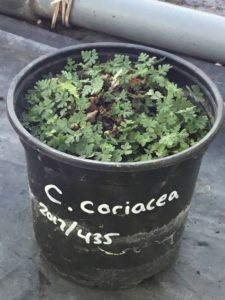 I label each pot by writing directly on each one with a paint marker, as they sit for quite a long time and sometimes labels can fade. 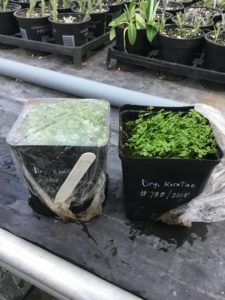 I use a non-chemical method to sterilize our soil and pots, which I’ve had some success with by running boiling water over the soil and then also microwaving the pot with its soil in for a minute. This kills off any unwanted bacteria, moss, fungus and other elements, as well as providing the moisture they will need. After a day of cooling we sow our spores by tipping out our perfectly folded envelopes from the BPS spore exchange onto the soil surface. 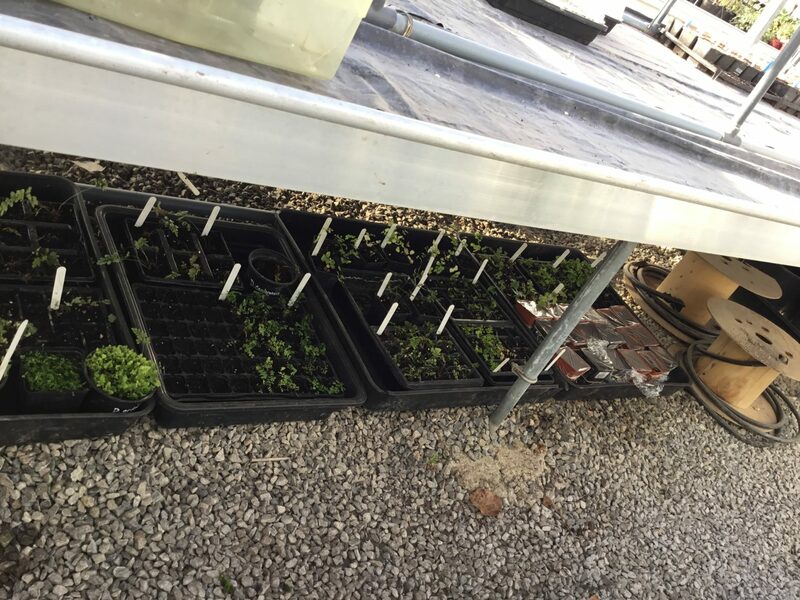 Without touching the soil, we then wrap them in cling film to keep moisture in and keep out unwanted guests. These pots are then kept under a glasshouse bench, out of direct sunlight for between six months to a year, before a moss-like growth begins to appear, which are the first stages of fern growth cycle. 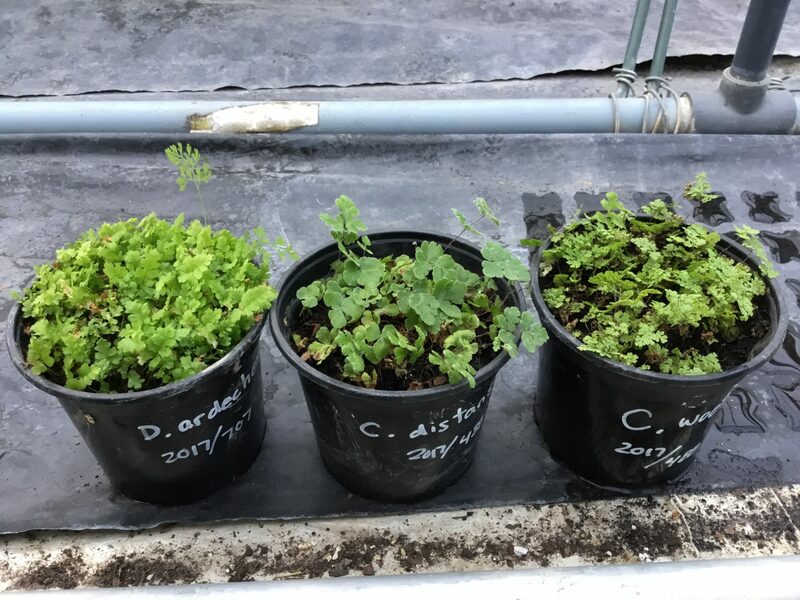 It’s quite some time before I prick any out, as I let them fill their pots and keep each other in good company before meddling with them and introduce any fungal spores, as well as waiting for a time when they are large enough for my big hands to handle them! I prick them out into groups or patches, and later, as they grow more, prick out the largest ones that survive. 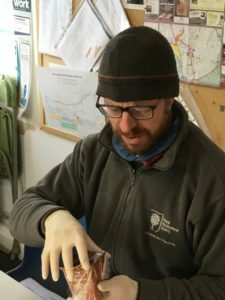 Sowing spores has been a rewarding method to learn and practice, as well as being good fun, in that they can be done at home or in a setting that isn’t completely sterile, something which has encouraged me to experiment and realise you don’t always need professional equipment to take on a challenge. Witnessing the whole process of something that looks smaller than dust becoming a plant still retains that magic and wonder for me each time. The amount of sporelings you can get is also amazing, so for restoration projects it’s a valuable technique. Even more, seeing ferns like Adiantum or a Asplenium or a Cheilanthes (there are so many!) with their first true fronds in miniature, is actually very special and beautiful! So enjoy and have fun with your spores and sporlings! Thanks, Aimee! I was wondering if your greenhouse where you keep the spores is heated. If so, what temperature? Oh hello there, we keep it to about 10; it’s frost free. We have retractable blinds to keep heat in a extra protection in severe cold as well as cooler in the summer months as shading. Hope that helps. 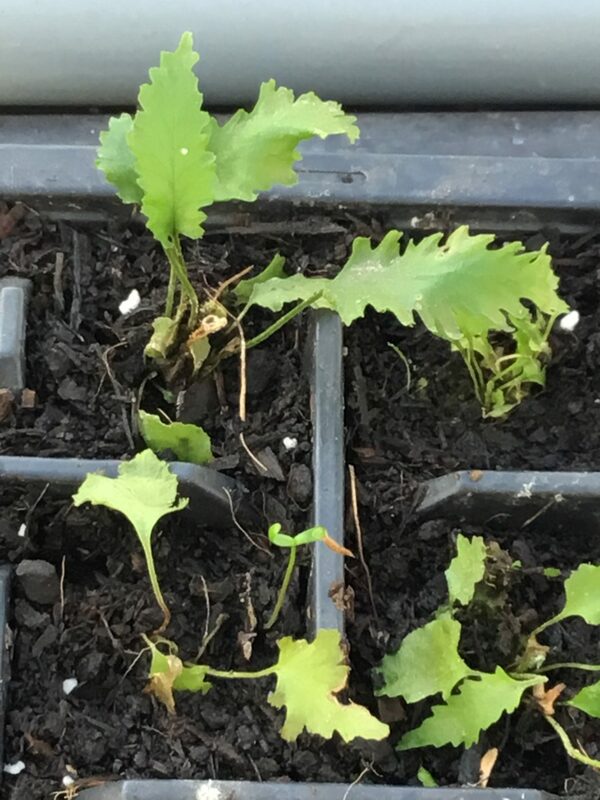 After the third or fourth year small ferns will be placed in a shade tunnel.